Paul Manafort goes through security as he arrives at federal court, Friday, June 15, 2018, in Washington. Paul Manafort has appealed a federal judge’s order jailing him as he awaits trial on charges by the special counsel that he ran a secret lobbying campaign for Ukraine. 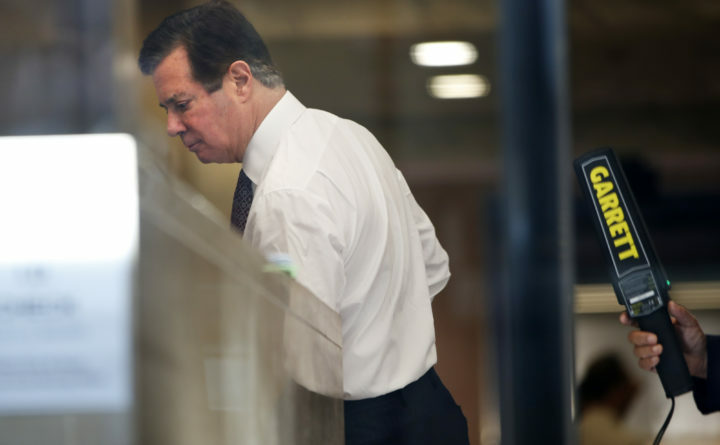 Attorneys for President Donald Trump’s former campaign chairman, who is being held at a Virginia jail, gave notice of the appeal in court filings Monday afternoon. “Defendant Paul J. Manafort, Jr. hereby appeals to the United States Court of Appeals for the District of Columbia Circuit from this Court’s order . . . granting the government’s motion to revoke Defendant’s pretrial release and denying Defendant’s motion to stay the order of detention pending appeal,” attorneys Kevin Downing, Thomas Zehnle and Richard Westling wrote. U.S. District Judge Amy Berman Jackson on June 15 revoked Manafort’s release under electronic monitoring after prosecutors alleged he tried to sway the testimony of potential witnesses in the case. Manafort had been under home detention since he was charged Oct. 27 in what prosecutors allege is a broad conspiracy to launder more than $30 million over a decade of undisclosed lobbying for a pro-Russian former politician and party in Ukraine. Manafort, 69, has pleaded not guilty to those charges in the District of Columbia, as well as to related tax and bank fraud in federal court in Alexandria, Virginia. The latest tampering charges, filed on June 8, revolve around allegations that Manafort and Ukraine business manager Konstantin Kilimnik tried to persuade two potential witnesses to falsely tell investigators their Ukraine lobbying effort did not include activity in the United States. Manafort has been held at the Northern Neck Regional Jail in Warsaw, Virginia, about 90 miles southeast of Washington. Manafort’s legal team also is trying to fight Berman Jackson’s dismissal of his civil suit challenging the scope of the special counsel Robert Mueller’s investigation of Russian interference in the 2016 U.S. election. The judge had ruled in April that Manafort may not use a lawsuit to thwart his prosecution. In the April 27 ruling, Jackson denied Manafort’s attempt to bar the special counsel from bringing future charges against him, citing the “sound and well-established principle” that potential defendants cannot “circumvent federal criminal procedure,” which allows for defendants to bring such proceedings within criminal cases. Manafort faces trial in Alexandria in July on tax- and bank-fraud charges, and in Washington in September over allegations of secret lobbying.